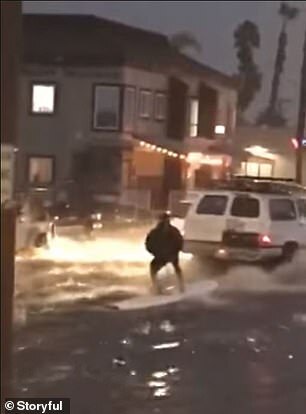 In the clips that have surfaced online, Soelberg, wearing what appears to be a hooded sweatshirt and shorts, can be seen carefully balancing as he rides a light-colored surfboard in the wake of the white van that’s towing him down the street. 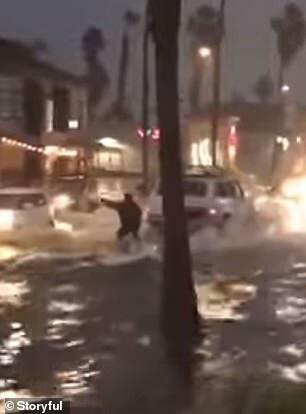 Soelberg told Fox 5 San Diego that he and his father had driven through the flooded area earlier in the day and knew that they needed to return to surf it. The video was recorded by Dane Barry, an employee of nearby Surfride Oceanside. San Diego County was hit with a massive storm Wednesday that that grew in size as it traveled around the region Thursday, 10 News reported.